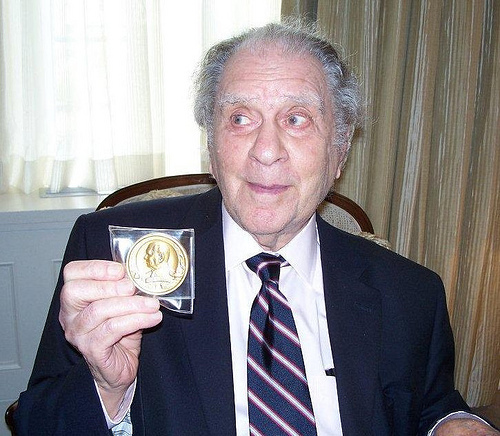 It is with great sadness to report that an icon of numismatics, Eric P. Newman, died peacefully at his home on Wednesday at the age of 106. Even if you never met Newman your life in numismatics has been changed for the better by his work. He will be missed by everyone. The following is the obituary scheduled to appear in the St. Louis Post-Dispatch. ERIC PFEIFFER NEWMAN died Wednesday, November 15, 2017, at his home in Clayton at the age of 106. Devoted husband of the late Evelyn Edison Newman for 75 years, brother of the late Ivy Steele of Chicago, beloved father of Linda Newman Schapiro of New York and Andrew (Peggy) Newman of St. Louis, enthusiastic and inspiring “Opa” to his many grandchildren and great-grandchildren. A life-long resident of Clayton, Eric attended John Burroughs School from the day the school opened in 1923 and obtained his engineering degree from MIT and his law degree from Washington University. Eric was a great lawyer, inventor, and historian, but he was best known as a numismatic collector and scholar, generous philanthropist, and inveterate traveler. He was a member of The Explorer’s Club and, with Evelyn, pioneered travel to every corner of the globe. Over the years, they enjoyed hosting family and friends both in St. Louis and at their homes in Jamaica, Martha’s Vineyard, and the bluffs of Alton, Illinois. Eric established the Newman Money Museum in St. Louis and authored over 100 books and articles, principally in the field of numismatics. Both directly and through his role in the Eric P. & Evelyn E. Newman Foundation, the Eric P. Newman Numismatic Education Society, the Harry Edison Foundation, and the Edison Family Foundation, he helped in the creation of St. Louis institutions such as the Butterfly House, The Magic House, the Eric P. Newman Education Center at Washington University, and many of the concepts and events dreamed up by his wife Evelyn. Their marriage was an enduring and remarkable model of love, partnership, effectiveness, and concern for others. The family wants to express its heartfelt thanks to Eric’s many compassionate caregivers. Per Eric’s wishes, there will be no funeral or memorial service. Any gift to your favorite charity would be a welcome tribute to his life. Messages of sympathy may be sent to EricNewmanFamily@gmail.com. Special thanks to Wayne Homren, Editor of The E-Sylum, for the text of the obituary.